Dan anchored last Friday’s episode of Nightline in an episode that dealt with body image and the American ideal in various ways. From the heart attack grill in Las Vegas, where obesity is celebrated, to the world of celebrity moms where post-baby weight loss is the norm, where does the future of nutrition of fitness stand? 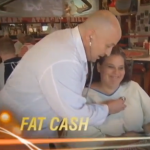 Dan introduced the stories, “Fat cash: in Sin City, you can do all kinds of things that are hazardous to your health, but the heart attack grill may just take the cake (or burger.) At this citadel of calories, grease is god, customers dress in hospital gowns, and business is booming. But with patrons actually dying, should what’s happening in Vegas stay in Vegas? …And it’s the hot mom backlash: with Kim [Kardashian] humble-bragging her post-baby-bod and Kate showing how to volley without volume, is it any wonder regular moms have had enough?” Watch the full episode for both stories here.